UAP-Outdoor-5 is end of life (EOL). Ubiquiti recommends UAP-AC-M for functional replacement. 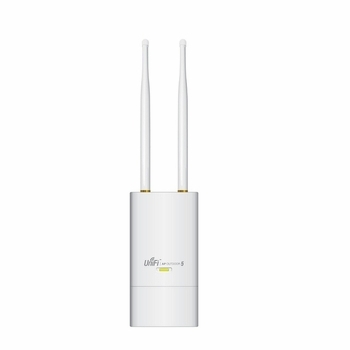 UniFi AP-Outdoor 5G (UAP-Outdoor-5): Outdoor UniFi model operates in the 5 GHz frequency spectrum. The UAP-Outdoor5 includes 2 external omni antennas and a secondary Ethernet port for bridging. It supports 802.11n MIMO with speeds of up to 300 Mbps and a range of up to 600 ft.